These bring back fond memories from when I was young and I and my children have had a great time making them together. They are really easy, and kids of all ages can have loads of laughs inventing funny, cryptic or cheeky sayings to write as fortunes. They are a quick and fun way to spend a rainy afternoon. 1. 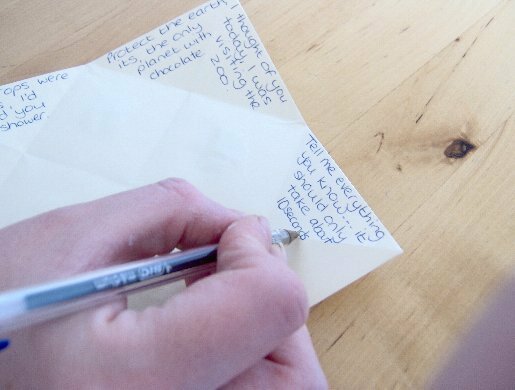 You need a square piece of paper (to make a square out of a piece of A4 paper, fold the top right corner across to the left hand side of the sheet, so that the top edge becomes level with the left side, fold and crease. Fold over the rectangle of paper at the bottom and crease. 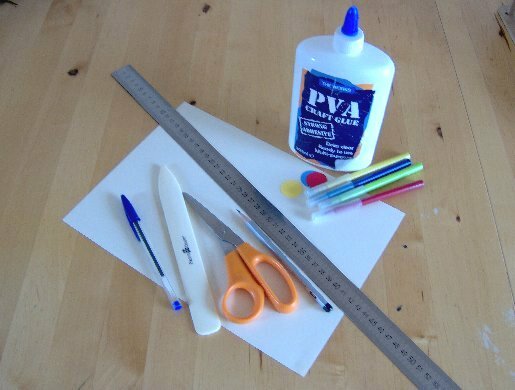 Cut the away the rectangle, leaving a square piece of paper). 2. If you have made a square from an A4 sheet you will have a crease marking the centre, if you are using and un-creased square of paper mark the centre point (lay the ruler across the paper from one corner to the opposite corner and draw a 1-2cm line at the middle, then lay the ruler across the other two corners and mark the centre in the same way. You will now have an X marking the centre point). 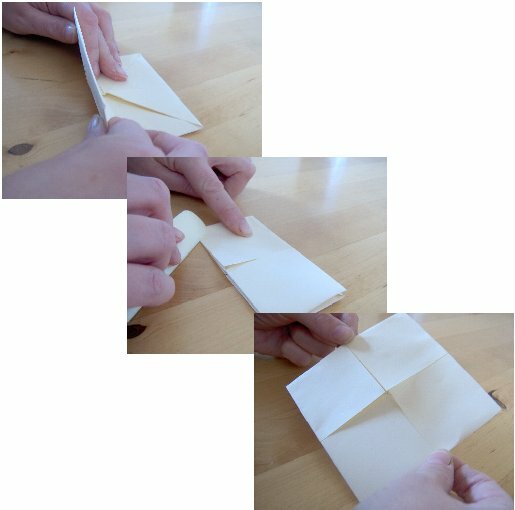 Fold all four corners into the centre and crease with a bone folder or your finger tip. 3. 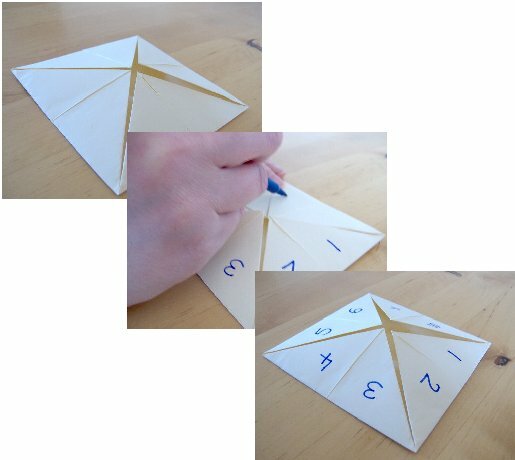 Turn the paper over and fold all four corners into the centre again and crease. 4. Fold in half (edge to edge) and press the crease, open out then fold in half the other way and press the crease again. 6. On the other side there will be four pairs of triangles, number these 1-8. 7. Lift up the numbered triangles and write down eight different fortunes, these can be funny, cryptic, or even a little cheeky. When you have written all the fortunes, fold the flaps back down. 8. 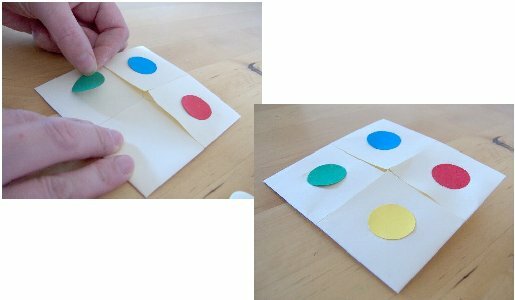 Slide your thumbs and first fingers under the square flaps and bring the points together. 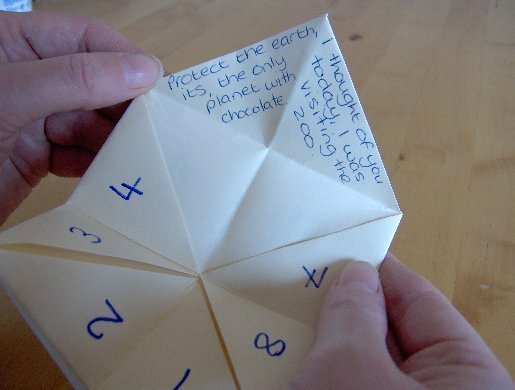 You open and close the Cootie Catcher by moving your thumbs and fingers from side to side or up and down. 9. 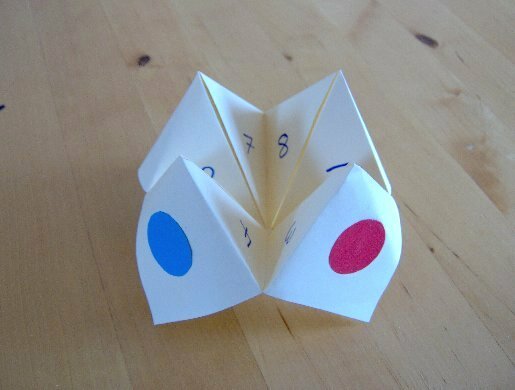 To play the game, ask someone to choose a colour, then you spell out the colour by opening and closing your Cootie Catcher, they then choose one of the numbers shown, you count out the chosen number by opening and closing as before, they then choose another number, you then lift up the flap and read their fortune.